On the left, the Original Sketch for the Thunderbird Nose Art. 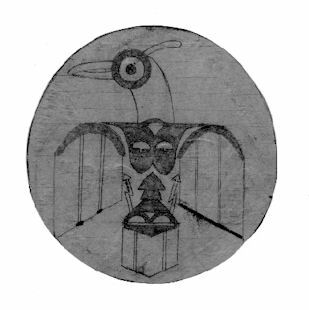 It was drawn by James S. Andrus, Radio Operator on the Original Thunderbird Crew in January of 1944. The name Thunderbird was suggested by Pilot Vern L. Moncur, saying it was "an Indian symbol for luck and we sure will need it." On the right, nose art on the restored Thunderbird beautifully hand painted by Gene Norris in March 2004. 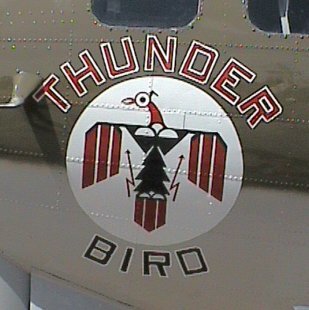 Mr. Norris, a volunteer at the Lone Star Flight Museum, researched the original Thunderbird and attempted to duplicate her nose art on the restored Thunderbird. The nose art now historically accurate. 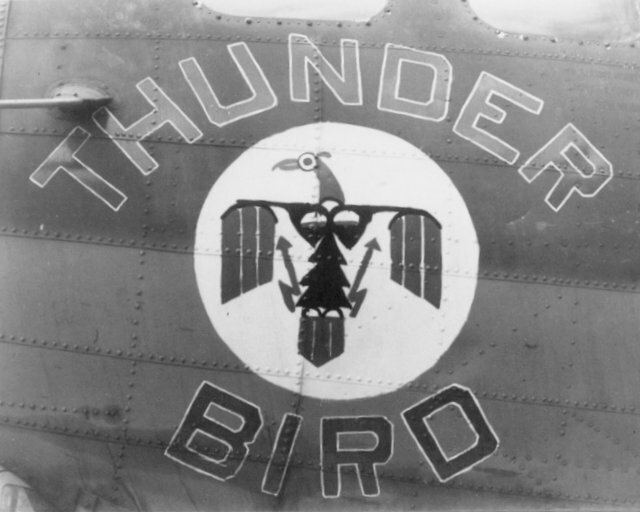 Below, a photo of the Original Thunderbird Nose Art. The photo is courtesy Clarence Simonsen, noted author and nose art artist.